Is Your Roof Ready For A Hot, Texas Summer? Outdoor temperatures in Dallas/Fort Worth, can be unbearable for humans, pets and plants at certain times of the year. What many people don’t realize is its impact on roofing materials. When things heat up in DFW, there are several things that happen to residential and commercial roofs. Unfortunately, all of them are bad and eventually lead towards roof replacement or repair. This is especially the case when the roof has also been neglected for many years or exposed to violent storms. First, the daily change in temperature causes the entire roof to expand and contract. Next, the UV rays heat up the shingles and underlayment. Consequently, some of the materials start to dry out, change, weaken, buckle, blister and lose their flexibility. Of course all of those things make it increasingly harder for shingles to bounce back properly after repeated expansions and contractions. In addition, roof top equipment may start to falter under the hot sun too. Examples include skylights, rooftop sprinkler systems, plastic rain barrels, and HVAC units. As a result, they may leak water, coolant, machine oil or other items that only add to the mess. Then when the warm weather storms roll in, they may cause those fluids to spread or add new damage (e.g. hail). The end result is a roof that is no longer capable of performing properly. Of course that inevitably means a new roof or roof repair is in order. Otherwise, the damage may spread to a building’s attic or crawl space and threaten areas of the interior as well. At Roofity, we’ve seen our share of damaged shingles and what can happen if they are allowed to remain in place for any length of time. We also know how important it is to use state-of-the-art equipment to uncover damage that may not be readily visible to the naked eye. So, you can count on our North Dallas team to solve a building’s entire roofing problem, the first time around. To learn more and request shingle samples before the heat of summer rolls around again, please contact us today. 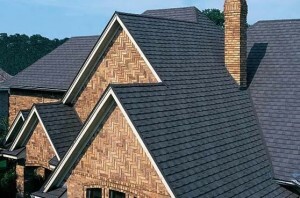 Shingles armor your roof and protect it from environmental harms. When a storm hits, it brings high winds, rain, and sometimes hail. All of these things wreak havoc on your roof’s shingles. Here’s what you need to know about the effects of storms on residential roofing and why you should get it taken care of by professionals as soon as possible. When the wind blows through, it gives your home a thorough beating. This includes the roof. Shingles tear and break. Shingles lift up. Shingles rip off. The wind has no mercy on your roof. When shingles dislodge due to wind, it leaves the surface of your roof compromised. 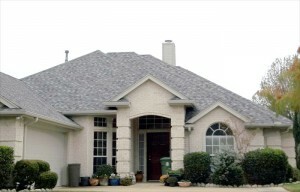 Replacing missing or damaged shingles right away is imperative to avoid further roof damage. When the integrity of the shingles is compromised, your roof is highly vulnerable to leaks, which will in turn lead to more wide-spread and costly damage. When a storm bombards your home with hail, the roof suffers. Just like wind, hail can loosen and damage shingles. Unlike wind damage, hail damage is sometimes difficult to detect and requires a closer inspection. When hail pelts shingles, it leaves pockmarks. These indents shorten the life of the shingle. If your shingles are asphalt (the most common), hail impacts can strip off the granules and soften or crack the shingles. This changes the structure and lessens their ability to protect the roof. After a bad storm, it is important to get a roof inspection and have any shingle damage repaired immediately. Shingles that are broken, lifted, missing, or impacted can leave spots on your roof susceptible to leaks and further damage. Often, storm damage is hidden and can only be discovered by a close inspection. With a kink in your roof’s armor (or several) your home is vulnerable. Leaks can lead to structure damage, rot, and mold. For further information or for an inspection, please contact us.